Carbon isotope discrimination (Δ13C) in charred grains from archaeological sites provides reliable information about water availability of ancient crops. However, as cereals are cultivated plants, they may reflect not only climatic fluctuations, but also the effect on water status of certain agronomic practices, such as sowing in naturally wet soils or irrigation. In this work, we propose a methodological approach to combine Δ13C data from different plant species, in order to discriminate between climate-derived and anthropogenic effects on ancient crops. 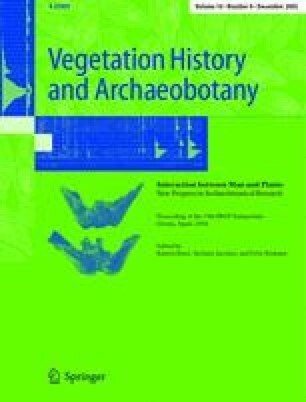 We updated previous models for estimating water inputs from Δ13C of cereal grains of Hordeum vulgare and Triticum aestivum/durum, and we applied them to published data from several archaeological sites, including samples from the Neolithic to the present day in northeast and southeast Spain, as well as from the Neolithic site of Tell Halula (northwest Syria). We found an important decrease in water availability from the Neolithic to the present time in the three areas of study, especially clear for the two driest areas (southeast Spain and northwest Syria). Potential differences in water management practices between wheat and barley, as well as between cereal and legume crops (Vicia faba and Lens culinaris), are also discussed on the basis of the comparison of Δ13C values across several archaeological sites.